This article is the second in a series. The next article will explain the importance of smartphones. 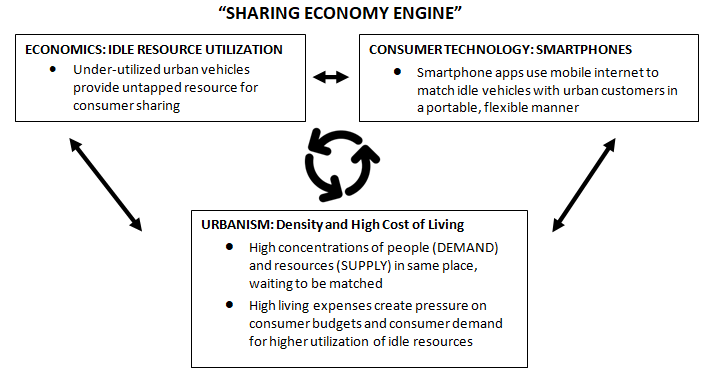 Our previous article introduced three defining features of the sharing economy, articulated by several authors in recent years: urbanism, smartphones, and excess capacity. These three “pillars” reciprocally interact as shown in the following info-graphic. Whereas the previous article in The Fuse examined excess capacity, quantifying the amount of idle vehicle space, this article will look at urbanism. The urbanism concept relies upon the basic fact that cities form due to the efficiency of “agglomeration” or “localization.” In essence, the dense clustering of people in urban spaces allows for significant economies of scale in the provision of goods and services, particularly those such as infrastructure which are more cost-effective when widely shared, and those based around information services (finance, insurance, education, media) which benefit from face-to-face interaction. In modern times, this “agglomeration” dynamic, which has likely existed since the dawn of cities thousands of years ago, plays a significant role in the facilitation of the sharing economy. Urban spaces experience a “density paradox,” in that as population grows, population density tends to increase as well. Urban spaces experience a “density paradox,” in that as population grows, population density tends to increase as well. This means that as cities grow, there is simultaneously less land available per person, but more people clustered into a given land area, i.e. more people per square mile. This land scarcity tends to bid up the price of real estate, thus raising consumer expenditures on housing and creating a need for lower-cost transportation alternatives. But more fundamentally, it means that while people may have fewer individual resources, thus inducing demand for shared services, the high density of people in a given space places a large amount of people in close proximity to one another. 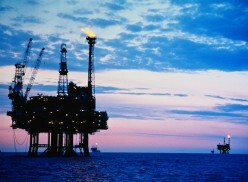 This in turn induces supply by making it easier for them to share resources with one another. 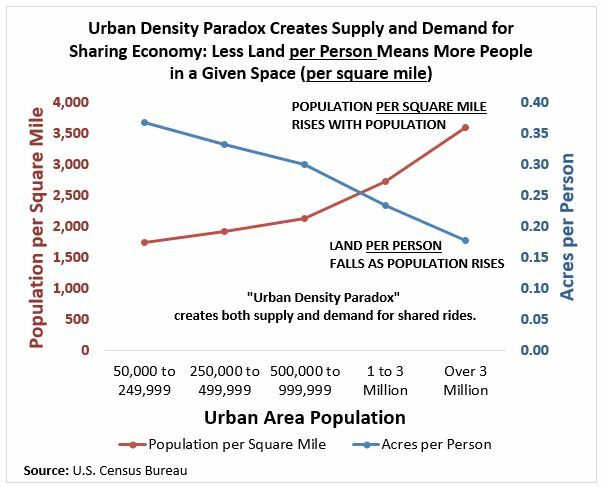 In other words, the “urban density paradox” simultaneously creates both supply and demand, especially regarding ride-sharing and vehicle-sharing. 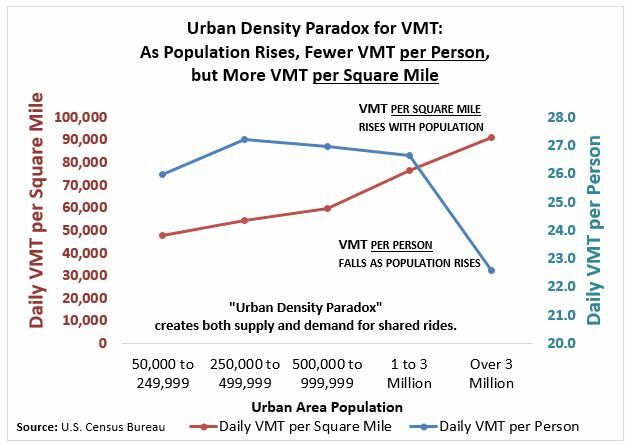 The “urban density paradox” translates into less vehicle ownership and less VMT per person, but more vehicles and more VMT per square mile. This means that a large amount of potential rides (in excess vehicles) in the very space where people have fewer vehicles and where individuals travel less frequently by vehicle. 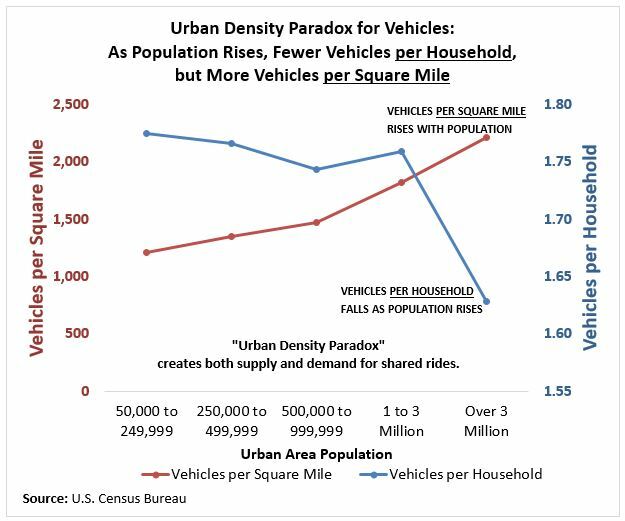 Fewer vehicles per household meets a surplus of vehicles in a high-density urban area. Demand meets supply. Whenever excess vehicles sit idle in an urban area (most vehicles sit idle 95 percent of the time), this most likely implies a ready pool of potential riders nearby, due to high urban density. An inclination to lower personal VMT in the largest urban areas most likely masks a hidden demand for VMT, unlocked by point-to-point e-hailed rides using services such as Uber and Lyft. Moreover, a very dense cluster of people who travel less per day may provide a pool of riders more willing and able to pay slightly extra for e-hailed ride shares, in amounts such that drivers can serve a large enough volume of riders to make their service profitable. Proximity and density are the key variables, by lowering cost and raising volume enough to make sharing services both affordable (for riders) and profitable (for drivers). Another aspect of the “urban density paradox” lies in the bid-rent curve. A key concept of urban economics, the bid-rent curve specifies that land use will typically go to the “highest and best purpose” under competitive bidding in a capitalist economy. At the margin, bids of developers and land-owners must match the rents which can be collected, in order to render land investment profitable and sustainable. In a highly dense urban space where many possible uses (retail, office, residential, commercial, industrial, etc. ), in almost endless permutations and varieties, seek to use a parcel of land, the price of that land can be bid up considerably. Typically, the bid-rent curve in highly dense places gets passed on to consumers in the form of higher prices for a large variety of daily items. The rise in housing costs, as urban population grows, most likely reflects less after-tax income available to be devoted to non-housing expenses. With respect to the sharing economy, as cities grow in density, the cost of living increases proportionately. 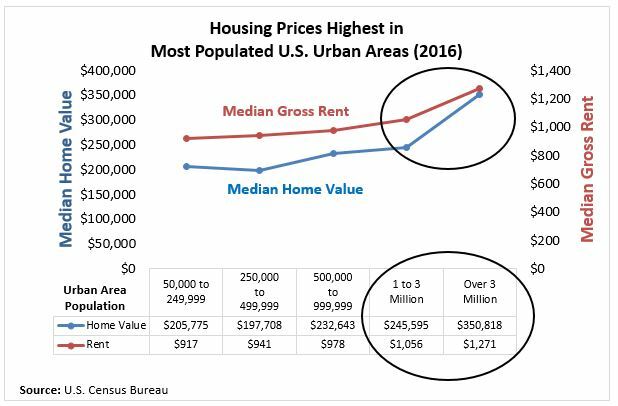 Two key housing statistics can illustrate this trend: Home values (for owned housing units) and gross rent (for rented housing units). The following graph shows each housing cost variable for urban areas of increasing population levels. The rise in housing costs, as urban population grows, most likely reflects less after-tax income available to be devoted to non-housing expenses. In turn, consumers may opt for ride-sharing instead of vehicle ownership. On the other hand, it is true that personal and household income tends to grow as urban population grows. Nevertheless, higher income in more populated urban areas suggests even more pressures on the household budget, in that it sets the cost bar very high. People who earn just enough to remain in these areas may not have enough money to afford traditional motor vehicle ownership, and people who earn more than enough may have such large disposable income that they can afford to use large amounts of ride-sharing services, and may forego vehicle ownership due to convenience. Is the sharing economy viable outside of the largest cities? Conditions for the sharing economy seem most favorable in America’s most populated urban areas (those of more than three million people). In these areas, the bid-rent curve operates the most strongly to squeeze out the space in consumer budgets for more expensive forms of transportation. In addition, vehicles per household and personal VMT fall off the most sharply, while vehicles and VMT per square mile increase the most in these highly populated urban areas. As of 2016, 95.3 million Americans lived in urban areas of population of three million or more, so this leaves 227.9 million Americans who did not. For the future of the sharing economy, a key question will involve whether smaller cities can generate sufficient supply and demand in their self-contained space to facilitate a truly comprehensive national “sharing market.” This remains to be seen. 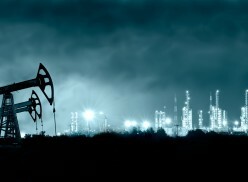 Fuel consumption implications: Can the sharing economy in smaller cities reduce fuel use? Smaller cities tend to have less comprehensive transit systems, and heavier reliance on solitary, driver-only rides in personal vehicles. 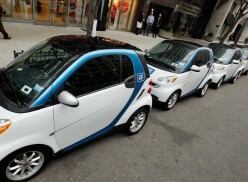 It remains an open question whether e-hailed shared rides can actually reduce fuel consumption. Given that it’s possible much of the shared rides in the largest urban areas have been siphoned from traditional transit services (transit ridership has declined as ride-sharing has been adopted), the question of whether ride-sharing can spread to smaller cities is not merely academic. These smaller cities tend to have less comprehensive transit systems, and heavier reliance on solitary, driver-only rides in personal vehicles. Therefore, if smaller cities could switch en masse from drive-alone to ride-shares, it could have a very significant impact on fuel consumption. Vehicle trips (and thus VMT) are more likely to decrease when existing vehicles on the road add passengers, than when vehicles which would not otherwise have been on the roads now offer rides which previously had been dedicated to public transit. Therefore, in terms of using ride-sharing to reduce fuel consumption, how can the smaller urban areas be targeted to effect a major increase in number of vehicle occupants per trip (and consequent decrease in VMT)? Can autonomous vehicles, or other new paradigms, combine with ride-sharing to address these less-populous urban areas? Once again, this remains to be seen. In the meantime, the third and final component of the sharing economy engine—smartphones—remains remains to be examined. In the next article in this series, the way in which smartphones interact with urbanism and excess vehicle capacity will be explored. Smartphones provide an unprecedented flexibility, circumventing traditional fixed-guideway and fixed-route transit services, via mobile e-hailing in ride apps. In addition, smartphones have benefited from a tremendous fall in computing and communications costs, in comparison to motor vehicle ownership costs, which have been steady or rising. Smartphone dynamics will be placed in perspective with respect to the other sharing economy pillars.